“Where do I start?… How do I begin to build a whisky collection with one eye on it being an investment?” This is the single most frequent question we get asked. One day, maybe we’ll get the time to publish something a little more comprehensive for those new to the wonderful, delicious, often daunting world of the whisky collector. Until then, taking a detailed look at one of the most buoyant auctions we’ve seen this year gives some clear direction of where target acquisitions should be focussed in the current market. Scotch Whisky Auctions September sale showed values for the right bottles are climbing… in some cases, rather rapidly. So what are the themes and trends? Forget ‘flavour led propositions’, ‘blank canvass allowing creativity’ and the rest of the NAS sales/marketing messages around old being UN-important. At the non-collectable end of the market, we get all that, the industry needs to continue and it can’t throw big ages around willy-nilly anymore. Elsewhere, age matters and it matters more than ever; so does vintage (date distilled) with older being better… From a collector/investor perspective these two dynamics are crucial. Some NAS bottles have been proved popular, and profitable, for collectors but their numbers are small. Taking a look at some of the bottles from last weeks SWA, specifically from Gordon & MacPhail, and the results are impressive. 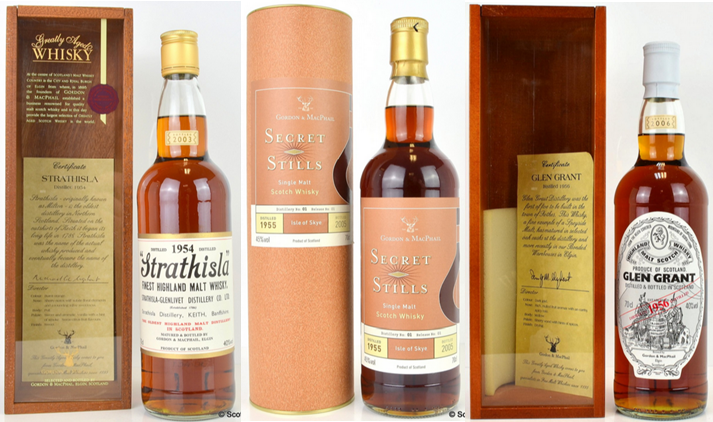 Bottles distilled in 1954, 1955 and 1956 flew to new heights with a 1954/2003 Strathisla achieving £640 (£220 in 2010), the 1955/2005 Secret Stills Talisker topped £1,000 for the first time at £1,150 (again, just £220 in 2010) and the 1956/2006 Glen Grant nailed £600 up from an all-time low of £190 in 2013. At these prices for bottles at c48-50 years old, we still see legs in buying. Older indie Springbanks also had a good auction with two notable bottles – The 1965 34 year old by Murray McDavid sold for £1,250, making its 2011 price of £300 look tiny. 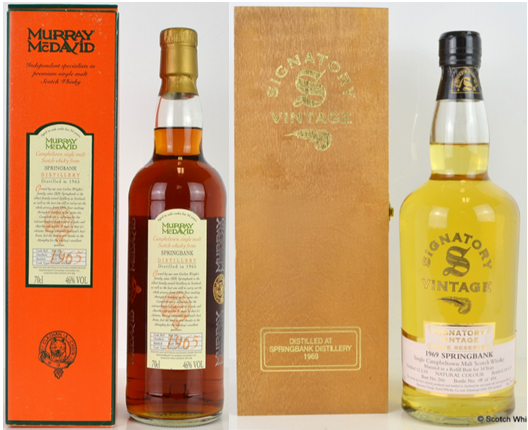 A Signatory bottled 1969, again 34 years old, made £620… With a 2011 price of £120, that’s some up-shift. ICONIC COLLECTABLES FROM ICONIC DISTILLERIES. A bottle of single cask Ardbeg Feis 2010, 1995 vintage (cask 2761) sold for £490 up from its previous £430 sale. Moving the vintage further back, a bottle of 1976 Ardbeg (cask 2392) achieved £1,750 up from £1,400 in May. The now almost legendary Ardbeg 1974 Provenance (4th release) hit £1,650 up from £1,300. Showing the increasing importance and value placed on indie bottles, a Douglas Laing bottled 1973 29-year-old Ardbeg fetched a massive £1,700 up from £540 in April 2014. Following August’s 2.17% increase in the Port Ellen Index, the OB’s appear to be on the move again in September. The third release was the only OB to fetch a new record price when it burst through the £1,000 barrier and settled on £1,100. The rest of the pack performed towards the top end of their trading range further recouping losses after tumbling from 2014 highs. 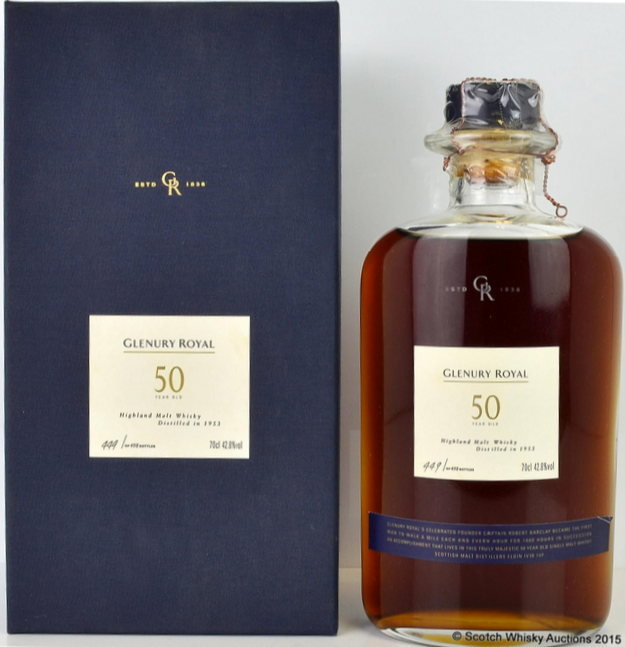 Combining a massive age statement and a silent still was more than enough to propel the Glenury Royal 50-year-old through a previous best of £3,000 to settle on £3,300. £820 took this bottle at its lowest in 2012. 50 yeas old AND from a silent distillery… it’s not going to do badly then! Staying silent but changing continents, Karuizawa does look to be softening as previously reported, particularly for more frequently traded bottles. A bottle of the 1983 30-year-old (cask 8606) sold for £1,750 down from £2,400, a Geisha label 1983 vintage (cask 2656) managed £2,400, easing down from £2,800 and a bottle of cask strength 3rd release came down from £450 to £410… Let’s be fair though, taken in perspective, it’s still no disaster! Aside from the above softening, prices still remain generally high for Karuizawa. Certain rarer bottles did experience gains with some of the infrequently seen NOH and Samurai bottles leading any significant increases. The whole secondary market remains exceptionally active. 2014 saw the last three months of the year flatten out. September doesn’t look like the beginning of an early year-end re-trace for 2015, far from it, values appear to be firming up. But as Q4 approaches should we be bracing for a dip? Previous PostKaruizawa Values FalterNext PostFake Macallan Gran Reserva 18 Year Old – What’s in the Bottle?